Some interesting facts about Red Bell Brewing. 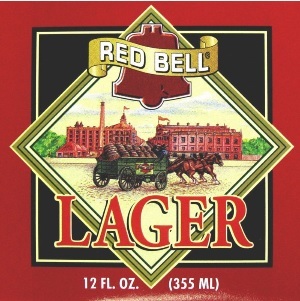 The Red Bell Beer Company had brews Philadelphia Original Lager, Philadelphia Light Lager, Irish Amber Ale in kegs, and their Original Lager in bottles. Red Bell also had brews a selection of specialty beers that are available on a limited basis. These include, American Pale Ale, Black Cherry Stout, Hefe-Weisen, Wee Heavy Scotch Ale and Ahopalyspe. The billboards started popping up in the Philly area in the autumn of 1993: “Philadelphia Is Putting Blondes Behind Bars,” a ribald double entendre aimed at advertising what the region’s newest brewing entity was calling Red Bell Blonde Ale. If the meaning of the billboards was somehow lost on a consumer, then the equally ubiquitous slogan, “Put a blonde at your table,” was there on posters, postcards, coasters, etc., as backup. James Bell, an ex-college football player and securities broker, and Jim Cancro, a civil engineer turned brewer, had closely followed the rise of the Boston Beer Co. a few hundred miles up the East Coast, and sought to replicate that firm’s rollicking success out of Philadelphia. They, like Boston Beer early on, would contract with breweries operating under capacity to make their own brands, including the Red Bell Blonde Ale and a lager called Red Bell Amber. This would free Bell and Cancro from the physical costs of a brewery, and its upkeep, and allow them to focus on marketing their new wares to the masses—something they did with gusto. There were the billboards and the coasters, of course. There was also the launch party in January 1995, at the Egypt nightclub, with Philadelphia Mayor Ed Rendell the guest of honor. Local celebrities, including Philadelphia Eagle Ray Ellis, invested in the brewery and helped spread the beery word. The old Veterans Stadium, home then to both the NFL’s Eagles and baseball’s Phillies, soon carried Red Bell brands. In a nationwide first for what was then called micro-brewing, Red Bell opened a working brewpub inside another sports venue: the recently constructed arena for the NBA’s 76ers and the NHL’s Flyers. Soon after, Red Bell opened a headquarters brewery in the city’s Brewerytown section; and its repertoire expanded to include a well-regarded Scotch ale, a pale ale and a black cherry stout. Sales ballooned by double-digit percentages in 1995 and 1996. The sky seemed the limit. And then … everything went spectacularly kaput. Red Bell has itself been one of Philly’s most significant contributions to beer, though not for a particularly joyful reason. It is the most jarring cautionary tale in smaller-scale American brewing over the last quarter-century—one to remember as Philadelphia Beer Week gets underway and as the number of U.S. breweries continues to swell. James Bell was a big admirer of Jim Koch, co-founder and driving force behind Boston Beer. Bell even referred to his new company as “the next Sam Adams” during its well-covered launch in the mid-1990s. Yet, whereas Boston Beer grew steadily and with targeted force, Red Bell grew manically, its beer brands increasingly hit or miss quality-wise and its super-charged production soon outpacing any real demand. The marketing had been spot-on, brilliant even; the product less so. In a bid to raise funds quickly, Red Bell went public—Boston Beer had, after all, and successfully. But the gambit proved a fleeting salve: After peaking at more than $5, Red Bell’s share price dropped below a quarter and then below a penny. Its Brewerytown headquarters went into foreclosure, and the state revoked the company’s brewing license because of $80,000 in unpaid payroll taxes. At the end, Red Bell proved too broke to go officially bankrupt: the legal fees involved were too much for it to pay. Instead, it entered a years-long limbo of legal wrangling and speculation, its brands slowly fading from shelves, menus and taps. That ghostly continuance saved Red Bell from becoming one of the nearly 200 U.S. breweries and brewpubs to close from 1996 through 2000, a shakeout that set the table for American brewing’s phenomenal growth over the last 15 years. The company, however, was emblematic of the brew-it-and-they-will-come ethos of much of smaller-scale brewing in the 1990s. For every Sam Adams, there seemed to be at least one Red Bell, if not many more. In 1998 Red Bell President James R. Bell signaled the opening of the Old English-styled brewpub by cutting a ribbon and inviting all visitors, travelers and airline and airport personnel to relax and refresh in the new facility. Philadelphia estimates that over 60 million people annually utilize Philadelphia International Airport. "Red Bell was 100% Philadelphia," Bell said. "Located in the city, brewed in the city and owned by many local men and women who believe in the viability of a locally-produced, quality micro brew, the new airport location will offer people from around the world the unique taste of Philadelphia -- the taste of Red Bell." Located in the heart of the new US Air B-C Connector food court and shopping mall at Philadelphia International, the Red Bell Brewery & Pub will offer visitors breakfast, lunch and dinner items seven days a week from 7 a.m. to 10 p.m. The handsome facility features a generous amount of wood finishings, high tin and copper ceilings, brass trim, warm lighting, comfortable seating and first-class, Philadelphia-style service. "We feel that Red Bell is an extension of the city," Bell noted. "We want every visitor at our airport brewery & pub to enjoy a positive image of Philadelphia, whether arriving, departing or just assisting friends or loved ones who are travelling by air." Issued / uncancelled but worthless security. This stock could some day be worth as much as the Ringling Brothers stock certificate because of its beauty & the Ringling stocks have sold for $300 to $1,000!!!!!!!! Red Bell Brewing Company Locations used to be. Once stock and bond certificates were considered wallpaper after companies had gone bankrupt or out of business. Today they offer financial history to collectors in the hobby with some nice pictures on the certificate. Many are from all kinds of companies that could make a great collectable gift for birthdays or holidays for that stockbroker or stock market investor. in Philadelphia where the 76ers & Flyer's play! "Strangely you can still hear the horses hooves on pavement, an active inner city stable being located in what could have been some brewery's home for draft horses. And perhaps even more bizarre, after a 60 year lull, the aroma of brewing can once again be detected in the neighborhood. It isn't the ghosts of brewers past conjuring up beer in historic F.A. Poth Brewery at 31st and Jefferson Streets. The new sign on top of the building proclaims that "RED BELL Company Welcomes You to Historic Brewerytown."" O'Well the ghosts are back because the Brewery is no longer there because they ran into financial troubles. Well the number did not work! Red Bell Brewing Co.’s securities registration has been revoked by the SEC following repeated failure to file required annual and quarterly reports with the Securities and Exchange Commission. Thus the company violated a crucial provision of the federal securities laws that requires public corporations to publicly disclose current, accurate financial information so that investors may make informed decisions. The revocations were ordered in an administrative proceeding before an administrative law judge. 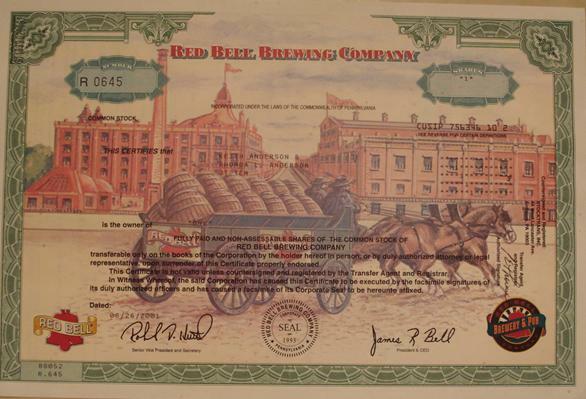 Red Bell Stock Certificates are worthless shares of stock, but are a collectible piece of financial history. An affiliate of Philadelphia developer John Wei has purchased the 200,000-square-foot Red Bell Brewing Co. building at 31st and Jefferson Streets in the city's Brewerytown section. Brewerytown Investment L.P. paid $1.85 million this month for the vacant 1870s brewery building on 70,000 square feet of land, according to Ken Wellar, a managing partner at Rittenhouse Realty Advisors, which marketed the property. The parcel covers 70K sqft and the building has about 200K sqft of interior space, seemingly ripe for adaptive reuse. The building dates back to the olden days of Brewerytown when it was home to the F.A. Poth Brewery, and in later years it was for furniture and appliance storage. 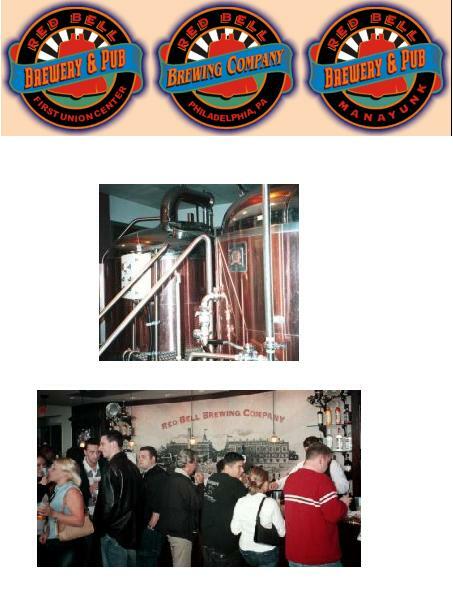 In the 1990s, Red Bell Brewery sprung up as part of a microbrewery boom, but it closed down in the early 2000s as part of a microbrewery bust. The building has sat vacant ever since. About Collecting: Old, canceled, "worthless" stock you find in Grandpa's attic might not be so worthless after all. Serious attention didn't begin to be paid to this subject until around 1976, following the publication of two carefully researched catalogs in Germany listing and illustrating the bonds issued in pre-revolutionary China and Russia, which were followed in 1978 by the issuing of monthly price lists by stamp dealer Stanley Gibbons, who also started to hold a series of public auctions. By 1980, Sotheby's, Christies and other London auction houses hopped on the bandwagon, achieving very successful results, as did the New York house of R.M. Smythe, holding the first ever U.S. auction devoted solely to vintage bonds and stocks. Today, some 30,000 collectors worldwide are active in this rapidly exploding field. An auction record was set this year when a Massachusetts collector paid $36,300 at a Smythe auction for the oldest known surviving stock certificate, dated June 7, 1783. Several elements go into the appreciation of these documents -- primarily the historic and the aesthetic. Many of the older examples were printed in several colors and featured fine engraving embellished with ornate, beautifully executed decorative devices and, treated as rare, numbered, limited editions, they are now often framed and hung on the walls of offices. Printed via methods similar to the way in which currency is produced, they boast sharp detail attained through the use of fine, continuous lines. Many collectors focus their attention on one particular industry. One of these is gold and silver mining stock certificates, superior examples of which, especially those relating to the California Gold Rush of 1849, are in great demand, as well as diamond and coal mines. The other two members of the top three are the building of American railways, beginning in 1830, and automobile companies. Among the secondary fields are electricity, water, oil, tobacco, textiles, coffee and tea, to name just a few. Other collectors focus on a specific period of time or historic area, such as pre-1800, or Confederate bonds and other American Civil War material, or on particular governments like imperial China or czarist Russia. Another segment of the scripophily community is more focused on design elements -- say in the art nouveau or art deco style. There are also a number of well-known printers whose productions are sought after, among them the British Waterlow & Sons, and Bradbury Wilkinson and De La Rue,and the American Bank Note Company in this country, the latter of which incorporated several other companies starting in 1858. Each firm employed a number of specialist engravers -- some, for example, concentrated on portraits (the most demanding), others on vignettes depicting, landscapes, buildings, trains, etc., while still others were responsible for the elegant lettering found on these certificates. Since so many historically important industrialists signed the documents of their companies, these autographs become yet another prime factor in collecting scripophily. John D. Rockefeller, who started the Standard Oil Company of Ohio in 1862 (for an initial investment of $4,000) is a choice example. Others include Commodore Cornelius Vanderbilt, one of the great railroad magnates, Henry Wells and William Fargo, J.P. Morgan, Thomas Edison, and various members of the Rothschild family, as well as notables from other areas, such as P. T. Barnum, Johann Strauss and Johann von Goethe. I do not sell stock certificates as an investment, but rather marketed as historic documents. Single share certificates were purchased from a registered broker-dealer that is not affiliated with me. I nor any other person associated with me is associated with a broker-dealer.